A new ABC News/Washington Post poll finds New York Sen. Hillary Clinton slightly ahead of Illinois Sen. Barack Obama in Ohio, but the race in Texas is neck-and-neck. 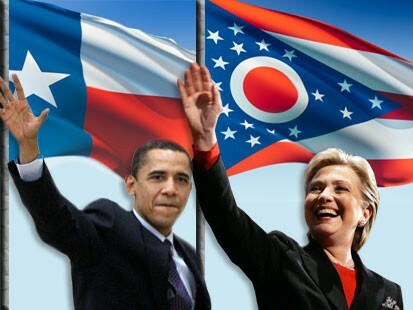 TRAILING in perceived electability, Hillary Clinton is running in a dead heat with Barack Obama in the Texas Democratic primary and holds a single-digit lead in Ohio, lifted there by lunch-bucket voters and party regulars. Both March 4 primaries have been described as critical for Clinton, who’s lost 10 straight contests, including Tuesday’s Wisconsin primary. Differing demographic and political profiles in Texas and Ohio change pieces of the puzzle – but both contests look close, with more than enough moveable voters to tip the balance either way. With about two weeks until the primary, this ABC News/Washington Post poll finds a 48-47 percent Clinton-Obama race among likely voters in Texas, and 50-43 percent in Ohio. A quarter in Texas, and a third in Ohio, say they could change their minds or are undecided. In Texas, Clinton’s being kept competitive by support from Hispanics; she likely needs them to turn out in greater-than-usual numbers, as they did in California, which she won Feb. 5. In Ohio she’s benefiting from a greater number of Democratic Party regulars than in Texas, from fewer college-educated or higher-income voters and from support in some union households. In both states, senior citizens are crucial to Clinton’s side; independents and younger voters, to Obama’s. And he’s taken a lead over Clinton on electability, a point he may try to drive home, along with his mantle of “change,” in the days ahead. Obama beats Clinton in the perception that he’s got the best chance of winning in November by 47-36 percent in Texas and 48-37 percent in Ohio. He trounced Clinton as more electable in Wisconsin; he’s also made broad strides on electability in national ABC/Post polling, moving up from a 43-point deficit in mid-December to just 5 points earlier this month. Obama’s lead on electability peaks among college graduates, a key group for him; nearly six in 10 of them say he has the best chance to win in November. Even women, less-educated voters and mainline Democrats – Clinton groups – roughly divide between her and Obama on who’s most electable. Indeed among seniors, her best group, well under half say Clinton’s got the best chance in November. For her part, Clinton continues to prevail as the strongest leader, by 53-36 percent in Ohio and 51-40 percent in Texas. That edge extends to some issues: she’s ahead in both states in trust to handle the economy as well as health care, her signature issue. Clinton has a slight edge in Ohio in trust to handle the Iraq war; in Texas, they’re even on the issue. Voters in both states split about evenly on the key dynamic of the race, a “new direction and new ideas” vs. “strength and experience”; the split mirrors the last national poll. It cuts overwhelmingly to vote: Eight in 10 voters who place more importance on “strength and experience” favor Clinton; about as many “new direction” voters go to Obama. Obama is slightly stronger among “new direction” voters in Texas (80 percent support him) than in Ohio (75 percent) – part of the reason he’s a bit behind there. Clinton does especially well among women, and particularly among white women, one of her core support groups, in Ohio. Obama makes more inroads among white women in Texas (39 percent support), though not up to his unusual 47 percent support from white women in the Wisconsin primary Tuesday. Hispanics are key in Texas; they favor Clinton by 59-36 percent, about the same as the average in exit polls across all primaries to date (61-35 percent). By contrast, it’s a much closer 50-46 percent contest among whites in Texas, while African-Americans there are favoring Obama by a 4-1 margin, 76-18 percent. That, too, resembles the outcome in all primaries to date (79-17 percent for Obama among blacks), but it’s lower than some of his high-water marks, including his 91 percent support from blacks in Wisconsin. Obama continues to do better with college graduates (who are less numerous among likely voters in Ohio than in Texas), with higher-income voters (also less numerous in Ohio); and with younger voters, particularly in Texas, albeit not at the level he achieved in Wisconsin. He leads by 59-39 percent among those under age 40 in Texas; Clinton comes back with 60-25 percent support among seniors there. Seniors also are her best age group by far in Ohio, 57-33 percent. The age gap shows up other ways. A quarter of likely voters in Ohio are from union households; they back Clinton by 53-37 percent, as opposed to a narrower 49-45 percent division among those from non-union households. Clinton lost union household voters to Obama in Wisconsin, though across all primaries to date she’s won them by 50-43 percent. There are very few union voters in Texas. Political allegiance also counts for much. Clinton leads among party regulars in Ohio (55-39 percent) and Texas (53-42 percent) alike; Obama owes his competitiveness to independents who intend to vote in these open primaries. He leads among independents by 53-39 percent in Ohio and 53-40 percent in Texas. Those are similar to previous primaries this year: Clinton’s won Democrats overall, by 50-44 percent; Obama’s prevailed among independents, 53-37 percent. There’s a difference on issues between these states: The economy and health care rank about evenly as the most important issue to Democratic likely voters in Ohio, cited by 34 percent and 30 percent, respectively. In Texas, 33 percent cite health care, with the economy second, 22 percent. Though demographics and personal attributes matter more, issue priorities do divide voters somewhat; in Texas, Clinton is supported by 53 percent of those who cite health care as their No. 1 issue, and 51 percent of those who cite the economy, versus just 39 percent of those who say it’s Iraq. Clinton’s lead among economy voters in Ohio, 52-37 percent, is bigger than her lead overall; that’s not so among health care voters. As noted, Obama trounces Clinton among voters who care most about change, and she beats him as broadly among those more focused on experience. But another measure fleshes out this equation, and raises a potential vulnerability for Obama. Two-thirds in both states say Clinton, if elected, would “do enough” to bring needed change to Washington; fewer, 56 percent in Ohio and 53 percent in Texas, say Obama has the kind of experience it takes to serve effectively as president. Additionally, while Obama leads as the most electable in November, more than six in 10 likely voters in both states say either candidate could beat John McCain, the front-running Republican. In Texas, seniors and Hispanics say by 2-1 that only Clinton could beat McCain; African-Americans, by 3-1, say only Obama could do so. In Ohio, college graduates, independents and blacks pick only Obama by especially wide margins. Enthusiasm for the candidates – potentially a factor in turnout – is running about equal for Clinton and Obama, albeit a bit lower in Ohio than in Texas. Turnout, naturally, is crucial. Clinton leads in Texas and Ohio alike among people who say they voted in the 2004 primary; new voters are better for Obama. Given their sharp differences, the relative mix of Hispanics and blacks voting in Texas is equally critical; Clinton’s support may rely on a boost in turnout by Hispanics over 2004, when they accounted for 24 percent of voters. On the other hand, Clinton arguably could prevail without a big Hispanic turnout, if instead seniors showed up in large numbers; they accounted for a sizable 26 percent of voters in the Texas Democratic primary in 2000, but then dropped to 19 percent in 2004. Likely voters in this poll account for 24 percent of the adult population in Texas and 30 percent in Ohio. While actual turnout at those levels is unlikely, vote preference results are similar in likely voter models positing much lower turnout. This ABC News/Washington Post poll was conducted by telephone Feb. 16-20, 2008, among a random sample of 611 Democratic likely voters in Ohio and 603 in Texas. The Ohio survey included an oversample of 27 African-Americans for a total of 104 blacks (weighted back to their share of the total population). Interviews in Texas were conducted in English or Spanish. The overall results in each state have a 4-point error margin. Sampling, data collection and tabulation by TNS of Horsham, PA.